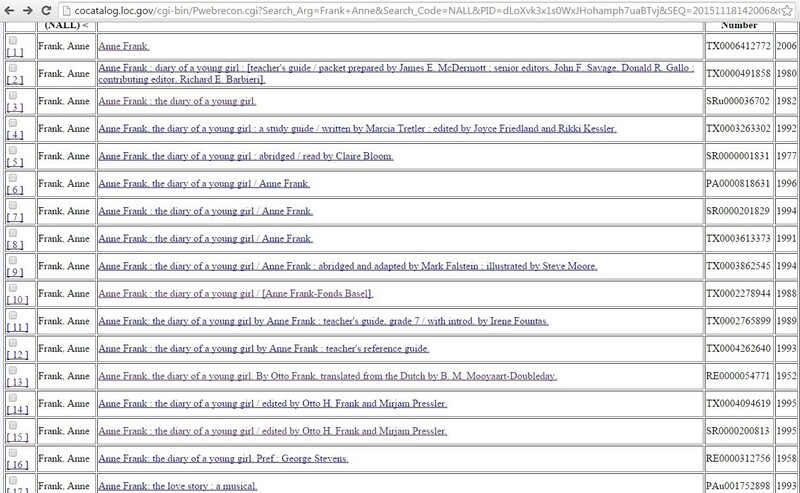 The reason for this has to do with the copyright afforded Anne Frank. She died in 1945, interestingly enough, the same year as Adolf Hitler. 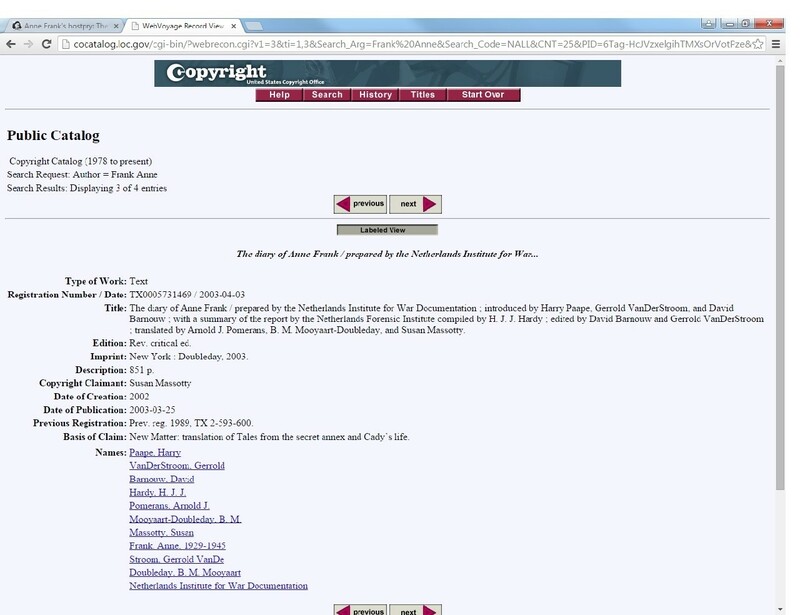 3 This means that “Diary of a Young Girl” and “Mein Kampf” having both exhausted their “life of the author plus 70 years” copyright term, will both enter the public domain in most of the world on January 1, 2016. This theory has some fundamental flaws, which will be discussed below. However, since I am not fluent in German, Dutch or Swiss copyright law, my analysis will have to be limited to what the Berne Treaty says on the subject, with some additional analysis of what United States Copyright law provides. “At the end of September 1942, after reading one of her favorite books ‘Joop ter Heul’ by Cissy van Marxveldt, Anne decides to write her diary entries in the form of letters to an imaginary group of friends of whom Kitty is her favorite…Anne continues to write in several notebooks, not all of which have been preserved, nearly all of 1943 is missing. “In the spring of 1944 Minister Bolkenstein makes his request on Radio Oranje for diaries and other writings made during the occupation to be kept. Anne decides to rewrite her original diary entries in the form of a novel. She wants them to be published after the war. She starts rewriting on loose sheets of paper on 20 May 1944 and continues in the ten weeks up to her arrest. “After the arrest the two helpers, Miep Gies and Bep Voskuijl collect all that they can find of Anne’s writings. A year later when it is clear that only Anne’s father is the only survivor of the extermination camps, Miep Gies gives him his daughter’s writings. From these Otto compiles the book ‘The Secret Annex’. This version becomes the C version and is a combination of passages from Anne’s A and B versions. “’He merged them, he cut them and he changed them. So he created a new book,’ Yves Kugelmann, a trustee at the Anne Frank Fonds, said in an interview, explaining that the foundation considers Otto a co-author. Contrary to what the Foundation may contend, the original diaries will enter into the public domain in most of the world at the end of this year. It does not matter when the diaries, or excerpts, or revised versions were published, nor does it matter who revised them. The guiding law is if Anne Frank wrote the words, these words enter the public domain 70 years after her death, no matter how many times they have been edited or revised. So, Otto’s “editorial revisions, annotations, elaborations, or other modifications,” did indeed potentially grant him a copyright in the new work “as a whole.” But the later copyright date would only apply to the material that he added that was new. It did not have the effect of creating a new copyright in the underlying work, which were the product of Anne Frank’s pen. Anyone, after the first of the year, can go back to the original text and copy whatever she wrote, in the “life plus 70” Berne Countries. Next, Otto is not Anne’s “co-author.” She was dead by the time Otto came into possession of the manuscripts. Key to the concept of co-authorship (under US law) is the requirement of “intentional collaboration” of the co-authors, an obvious impossibility here. (The Berne Treaty references “joint authorship” but does not define it.) As Anne’s sole heir, Otto no doubt owned the copyright in Anne’s manuscript, and was well within his rights to edit and modify the work as he saw fit. But, once again, this does not extend the copyright term in and to the preexisting material. Under the plain text of the Berne Treaty, the material Anne wrote is tied to Anne’s lifetime, not Otto’s. But, enough is enough. Even though the money is going to good causes, that is no reason to attempt to twist the copyright laws into nonsense. Seventy years is plenty enough time to take advantage of the profits of this unique book, which unlike most books, has been an international best-seller every single year that it has been in publication.